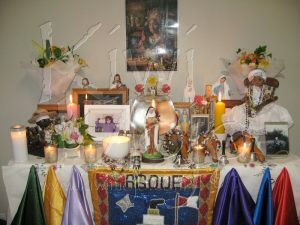 After God, yet before all other Spirits in the African Diasporic Traditions of Santeria and Vodou come the Ancestors. The ancestors are the foundation of who we are, they are of us, and they once were where we are now, and so they have a much closer affinity to our complaints than do other Spirits. They also long for us to succeed, because if we succeed it reflects that they succeed. More than this, the ancestors also long for our attention of them. Through our regular devotions to them, they too are elevated, they move further towards to the light and come closer to the full understanding of their place in Heaven. Through their elevation, we too are elevated, and reach further towards our own potential. One of the first things that we are taught to do within the Traditional African Religions, and the African Diasporaic Religions is to build a strong relationship with our ancestors. Once this relationship is built, we can ask them for assistance in almost every aspect of our lives, and they will be there to help. If we have good relationships with many of our ancestors, we can turn to ancestors who in life possessed what it is we seek in our own. For example, if I want to obtain more money, then I could turn to an ancestor who was very successful financially in life. I can call on that energy to assist me now, and know that because that ancestor is of my flesh and blood, they will do so for their own elevation. The first step in building this relationship is to show respect and honour to our ancestors and respect to all the departed in general. We should care for the graves of our ancestors regularly. If your ancestor graves are too far away for you to tend to them, then tend to the graves of the deceased in general. Throughout South America, November 2nd, also known as All Souls Day is recognised as a day to honour our ancestors. On this day, the cemeteries become crowded, with people singing and dancing, celebrating with their ancestors. They clean the graves and decorate them with offerings of foods and sweets, drinks of all the types that the ancestors enjoyed in life, and of course flowers and libations of water are placed and poured. Throughout Cuba and Haiti, sacrifices are made to the ancestors as well to further strengthen and elevate them. This is something we can do in our own cemeteries for our own ancestors. We don’t need to wait until November 2nd, but instead can come together to care for the dead any time. There are great rewards in ensuring that cemeteries are tidy and graves are clean. I often remind my godchildren, the ancestors love us, where we are, they once were. It is thier blood that runs through our veins, it their DNA that forms our bones. It is through them and because of them that we are here, and they know it. They don’t forget us. If we feed them, and keep them strong, if we elevate them through light and heat and energy, then they will always be able to help us and guide us. They will be able to come to us to answer questions, to assist in our requests and advise us of the right course of action in any circumstance. Let us not forget them. Interested in practicing the Afro-Caribbean religoins of the Diaspora, the very first thing that you will want to start with is to serve your ancestors. 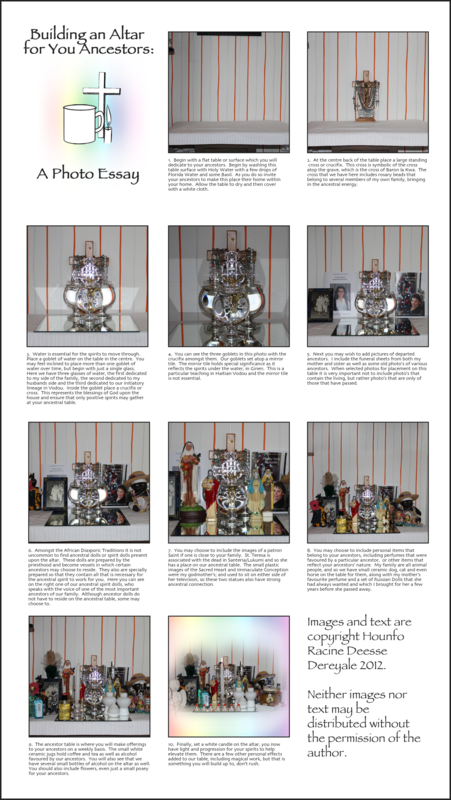 There are lots of ways that this can be done, but let me share with you what I do. That’s it. It takes about 2 minutes in total, and gives my ancestors refreshment (the water), light (the flame) and energy (the heat from the burning wax). It strengthens them, helps them to grow stronger and elevates them further towards God. On Mondays I offer our ancestors a serving of whatever we are having for dinner. In most Spiritual traditions, the ancestors are fed somewhere away from the normal household routine. We serve our ancestors’ food behind the laundry door or before the cross. We cook them a full portion of our dinner. We place a glass of cool fresh water on the ground, we light a large white candle, and offer them the food and any drinks they might like, coffee, tea, beer, rum, whiskey, wine, anything at all. The food is left overnight, and then thrown in the rubbish. Bottles of alcohol are placed on the ancestor table for the Spirits to continue to enjoy. 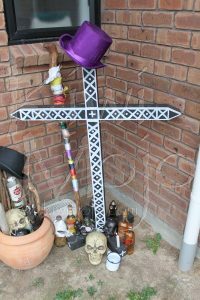 When the ancestor table or cross becomes too covered in alcohol, we take the older bottles to the cemetery and pour them out for the ancestors at the gateway. In Haiti one very seldom finds an ancestor table or ancestor altar built or created unless a special ceremony is being offering for the dead. Such altars are usually very simple, such as those created for the Bohoun, the ceremony for those that have died. Such altars are usually a simple table with a white fabric cloth covering the top. In the centre is a lamp set in a white bowl and a glass of water. There will be flowers present as flowers give the gift of life to those that have passed over. These altars though a temporary. Most Haitians offer daily service to the ancestors through the process of pouring for the spirits, and annually offering food to the ancestral spirits at the cemetery. These food offerings are usually presented in November as a part of the Ghede ceremonies. Haitian Vodouwizan will usually serve their ancestors at family grave plots within the cemeteries, or at special tree’s, or sacred crosses that are a part of the Lakou or peristyle. Outside of Haiti we are often very far from the graves of our ancestors. 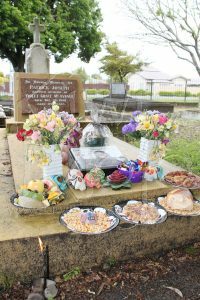 It may be hard for us to travel to the cemetery often to clean the graves, make offerings of food, water, light and alcohol and so it can be helpful for us to dedicate a table to our ancestors. This table is where we can offer them light, refreshment, and prayer. An Ancestral Altar, zanset pe, is a very personal space. This is a space where you will commune with your ancestors, and you want this place to be welcoming to your ancestral spirits. With such a personal space, there are only a couple of fundamental rules. Everything about this table should reflect your family, your ancestors, their likes and life. With this in mind it’s easy to understand that this table more than any other will be prone to evolution. As you get to know your ancestors better, as you learn their likes and dislikes, and as you begin to hear them, you will begin to hear what your ancestors would like included on their table. You may choose to set up an ancestral table anywhere, but remember that this is a place where you will quietly interact with your ancestors, it’s where you will speak with them and take the time to listen to them. It is where you will care for them, keep the table clean, tidy, refreshed with clean cool water and candlelight, and care for it, just as you would care for the grave. 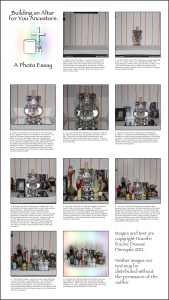 We have created a tutorial to help you create your own ancestor altar. Simply click the image below. Vodouwizan celebrate the month of November as the time of the Ghede. November 1st and 2nd are often celebrated as the Haitian Vodou Feast, Fet Ghede, however the celebration of the Ghede is not limited to these 2 days. Throughout Haiti in the month of November [and more recently in the US as well] one will find celebrations being offering for the Ghede. Singing and dancing underneath the peristyle, people dressed in Black, Purple and White, and the Ghede themselves singing and dancing in the peristyle, in the street and of course in the cemetery. What many people forget is the November is also the Month of All Souls in the Catholic Church. This is the month where Holy Mother Church, and Vodouwizan will make special services and sacrifices to their ancestors. November is seen as a time when the ancestors are truly amongst us, where, just like the Ghede Spirits, they may come to sing, to dance, to speak words of wisdom, to tell the future, and to resolve family conflicts. So what can we do, those of us that are far from Haiti, to celebrate and elevate the ancestors through the sacred days of November? During November, either on November 2nd or at some other appropriate time you may wish to offer a Feast to your ancestors. Preparing a feast is a great way to spend time communicating with your ancestors, and gives you the opportunity to celebrate with them. So, what form does this feast take? You might want to take the time to prepare a menu, make a list of all the foods that your ancestors liked in life, include all the foods that you know. If you are not sure, look at the culture that your ancestors comes from. For those of us with Hispanic Ancestry, we can make delicious feasts of red beans and rice, fried plantains, customary cocktails and coconut puddings. Roasts make delicious foods for your ancestors, perhaps pasta, pizza, and red wine for an Italian ancestry, and even a selection of pastries. Include any foods that you know they will enjoy. You will then set about preparing the foods. While you are preparing them, let the ancestors know that you are cooking for them … talk to you ancestors as you go, “Gran, check it out, I’m making your mint jelly recipe, and this cake that came from Great Granny James.” Chat with them as you mix and stir and cook. Let this be a real family event. When each dish is finished, serve it on a chipped plate, on a plate that belongs specifically to the ancestors. If you do not have plates that are for your ancestors, you could purchase paper plates [please make sure these are environmentally friendly options] and serve the foods on these. You will also want to prepare drinks for your ancestors, A goblet of cool, clear water is essential, and traditionally you would also include coffee, and if you ancestors are partial to it, include some tea as well. It’s great to include alcoholic beverages that your ancestors enjoyed as well, Rum, Whisky, Scotch, Brandy, Wine, and even Beer can be laid out for your ancestors. Now, if you have a family tomb near you, you can pack all of this up, and take it to the cemetery. Lay all of the food, drinks, sweets and offerings out on the grave, and light a white candle. Talk to your ancestors … you may choose to bring additional food and drink for yourself, and any other family members that are joining you, that way you can enjoy a picnic with your ancestors. This is the time to share with them, to celebrate with them, and to enjoy yourself. Sing songs, there are plenty of Vodou songs for the ancestors, or sing songs that your ancestors were fond of, play music on a portable music player if you like, invite friends and family to be a part of this, and make it a real celebration. Tell stories about your loved ones that have now departed and to them. One of your kids did or said something funny, go ahead and tell them! When you are finished, leave all the food, drinks and pastries along with any offerings on the grave and head home. In the next couple of days, return to the grave, pack everything away tidily, clean the grave, wrap the offerings in brown paper and place them in the bushes in the cemetery, and ensure that everything is clean and tidy. Leave the bottles of alcohol with your ancestors, unless it is not safe to do so, and if you can’t, pour the alcohol out for them. If you do not live near a grave of one of your ancestors, you may lay the ancestral feast out at home, perhaps in a garage or some space where you can serve the ancestors away from the day-to-day bustle of activity within the home. You can build a small altar for your ancestors in this space, by laying out photo’s of them, or trinkets belonging to them amongst the food present. Again, spend time with them talking and laughing just as you would at the cemetery. When you are done, pack all the food items up and wrap them in brown paper and take them to the cemetery, the alcohol bottles you may choose to leave on your altar for the ancestors. Traditionally the Catholic Church spends the Month of November offering the Holy Sacrifice of the Mass for the Faithful Departed. Different Churches will do this differently, so I have included a couple of options on ways to have the Holy mass offered for your ancestors below. In many Catholic Churches, on the first of November they will put out sheets of paper with a pen. This sheet of paper has lines on it, and here you can write the names of all those in your family that have passed on. These are the Faithful Departed. For each and every Mass that is said the Priest will collect the papers, and roll them in a purple scroll and place them on the altar, dedicating the Holy Sacrifice of the Mass to all of those whose names are included. Traditionally you would make a small donation as an offering to the Church, and there may be a box near the sheets of paper to do this. $20.00 is usually an acceptable offering. If the Church does not offer the above method, you may go to the Church office or speak to the Priest directly, and request a Mass be offered for the Faithful departed of your family. You would in advance write out the names of all of the members of your family that had departed (and at the end add something like, and all the faithful Departed of my Mothers side and my Fathers side whose names I do not know), and place them inside an envelope with a donation of $20 – $40 depending on what you can afford. The Priest will then schedule a Mass for your ancestors which you should attend. If for some reason you can not get to a Catholic Church, you might hire a Houngan or Mambo, or a Pret Savanne (a type of lay Catholic Priest in the Vodou Tradition]) to perform a Libera for your ancestors. The Libera is similar to a Mass in that we sing songs from the Catholic Liturgy for your ancestors, to elevate them. Beginning on November 1st and finishing on November 21st, some Vodouwizan like to offer a Rosary each day for their ancestors at the ancestor table. When elevating the ancestors this way it is common to begin by taking the water, and any other liquid offerings such as coffee or tea or opened liquor off the altar and offering clean fresh water and fresh coffee and tea each day. 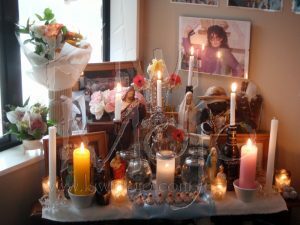 Once the fresh water and offerings are placed on the altar, light a white taper candle, sit in front of the ancestor table and recite the rosary. Each day, clean the table, make sure it is pristine white, fresh and clean, that there are fresh white flowers present and that there is no dirt. After the recitation of the Rosary, you may wish to read to the ancestors from the Bible or simple commune. Allow the taper candle to burn all the way down. On the final day of the Novena, you should refresh your table, make sure everything is new, change the water, the flowers which now can be a bright colourful display, add coffee, tea, alcohol, present a small feast to your ancestors. Recite the Rosary for the last time for the Novena. Let your ancestors know that you are happy to have spent the last 21 days in prayer with them. Leave them with the food offerings overnight, and the next day wrap them in brown paper and dispose of them at a cemetery.